John Bollard is one of a tiny elite of world experts on the Mabinogi. 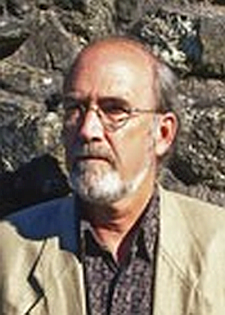 His pioneering work in the field as translator and analyst, revolutionised the Mabinogi paradigm, building a new, structural school of analysis from the mid 1970s.Bollard, John Kenneth. 1974. “The Structure of the Four Branches of the Mabinogi.” Trans. of the Hon. Soc. of Cymmrodorion, 250–76. Dr. John K. Bollard, pioneer of modern Mabinogi scholarship. It was Bollard’s innovative insight to bring Eugene Vinaver’s 1970s concept of interlaced poetryVinaver, Eugene, 1971. The Rise of Romance. Clarendon Press., Oxford. into Mabinogi prose analysis. Bollard himself then drew upon Celtic knotwork art as a cultural ancestor to Welsh mediaeval literature. The result was radical, and solidly constructive, as the patterns in the Mabinogi tales are revealed as non-linear, a worldview of interlacing as in Celtic knotwork. The tales, Bollard has shown, cannot be understood as simple linear sequences through time. Instead the tales form an intersecting complex, which can only be grasped as a whole if its threads and components are compared and contrasted, across their boundaries of sequence and plot. John K. Bollard books, mediaeval Welsh prose tales, trans. and illustrated by appropriate landscape photography by Anthony Griffiths. Bollard’s approach eventually culminated in his own series of new Mabinogi translations and commentary. 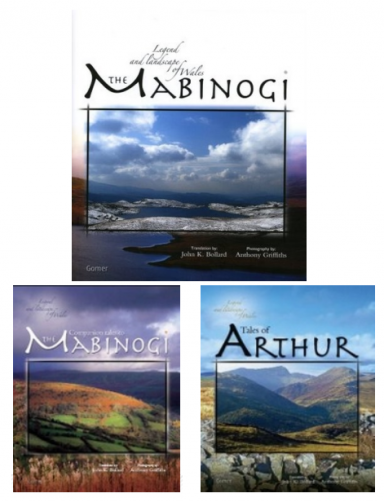 His innovative book in 2006 “Legend and Landscape of Wales: The Mabinogi” was exquisitely illustrated with site appropriate landscape photography by Anthony Griffiths. As Charlotte Guest once did, Bollard asserts the value of the text by the manner of its presentation. Bollard’s discreet inline notes support different levels of reader, the academic and the general alike. His Introduction provided a useful summary and further clarification. More volumes of mediaeval Welsh prose in translation, have followed, with a similar strategy of apt illustration and sensitive design. In an iconoclastic paper placed online in 2007 Bollard asks “What Is The Mabinogi? What is ‘The Mabinogion’?” and his answer is uncompromising. Bollard argues from the sheer diversity of the tales in style, structure, values and period, suggesting they are a pretty random bundle in mediaeval MSS. versions. Charlotte Guest did more than anyone to promote the ‘Mabinogion‘ label, although she did not initiate the construction of the concept which dates to the 18thC. The Guest journal for March 8 1843, notes she decided not to include some of the stories usually considered part of the contemporary Mabinogion as they were “mere vapid translation from some Norman original.” Phillips, David Rhys. 1921. Lady Charlotte Guest and the Mabinogion; Some Notes on the Work and Its Translator, with Extracts from Her Journals. Carmarthen: W. Spurrell & Son: page 35. Over the 20thC the name ‘The Mabinogion‘ became understood as a linguistic error,See the article The Mabinogion. and Bollard’s indictment might well have opened up a new direction in the field. However in parallel with this well founded challenge from Bollard, Sioned Davies’ redoubtable eminence renewed the usage of the discredited name as the main title of her new translation in 2008. Davies, Sioned, 2007. The Mabinogion. OUP, Oxford. Reprinted as The Mabinogion. Oxford World’s Classics: Oxford University Press (2008) ‘The Mabinogion‘ with all its strange package of errors continues to fight another day. For Bollard’s other positions and involvements, and brief education profile, see page 2. Or visit his own site which is a delight to browse. It has news of his latest work, and more about his by now classic Landscape series. For a relevamt Mabinogi bibliography on John Bollard, try this link for my Mabinogi Bibliography. 1. ⇑ Bollard, John Kenneth. 1974. “The Structure of the Four Branches of the Mabinogi.” Trans. of the Hon. Soc. of Cymmrodorion, 250–76. 2. ⇑ Vinaver, Eugene, 1971. The Rise of Romance. Clarendon Press., Oxford. 3. ⇑ Arnold, Matthew. 1867. On the Study of Celtic Literature. London: Smith, Elder, and Co.See also the work of W. J. Gruffydd. 6. ⇑ Phillips, David Rhys. 1921. Lady Charlotte Guest and the Mabinogion; Some Notes on the Work and Its Translator, with Extracts from Her Journals. Carmarthen: W. Spurrell & Son: page 35. 7. ⇑ See the article The Mabinogion.